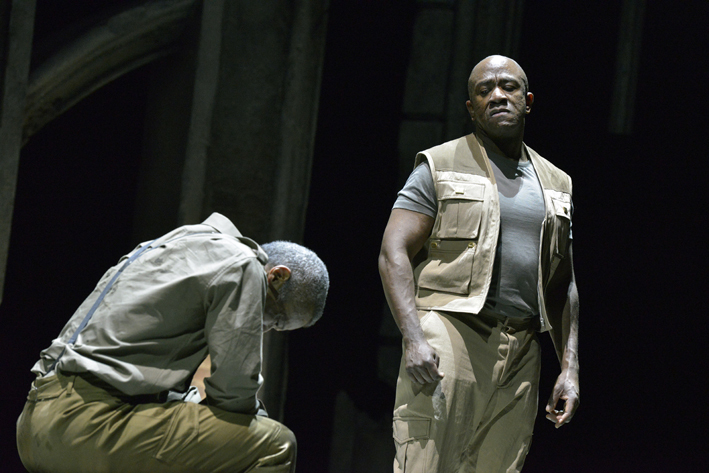 A genuine black Othello is a given, but adding a black Iago is the first for the RSC. Playing with the casting colour is not an amazing innovation … an old colleague regaled me for years with tales of his “B&W negative” production in Africa in the 1950s, where he, the only white guy in the cast, played Othello. We’d agree that the white actor in greasepaint black face is in the dustbin of history. Reviews say that a black Iago moves the plot from racism to pure jealousy. I don’t know that racism is the right word, surely it’s also or rather ‘colour prejudice’. Germany 1930s was white v white racism. The recent history of Africa has black tribes falling upon their enemies of a different tribe. A production irony is the magnificent set. It starts as Venice with a gondola on water, flies in a golden roof for the Doge of Venice’s chambers, drops in a shattered church window for Cyprus. All great stuff, but it makes you wonder why The Merchant of Venice, sharing the same stage just the day before, avoided all of that Venetian ambience. Water carries through, with two large grills over the pool that can be raised to form conference tables, or platforms. Othello’s overhearing scene (Iago and Cassio) has him crouched in the water beneath the platform. There is a lengthy torture scene where Iago is supervising waterboarding a prisoner, while Othello calmly looks at paperwork to one side. This is, needless to say, not in the text. It’s a Gulf War / Guantanamo reference, and serves here to show that Othello is quite used to violence in his profession … we already knew that about Iago. As the tortured one has a black hood over his head it could be any member of the cast. I doubt they’re queuing up to play that one. I wonder how people who have been in the armed forces feel about their theatrical depiction. It seems a knee-jerk reaction to first put people in Desert Storm colors then have them looking around for someone to torture. Actually there was a minor issue with all the water swilling about. I would be worried about the grill being slippery, but it wasn’t that. Emilia and Desdemona have to sit on it at one point. It left Emilia’s light coloured dress with a wet patch at the back just where you wouldn’t want one. 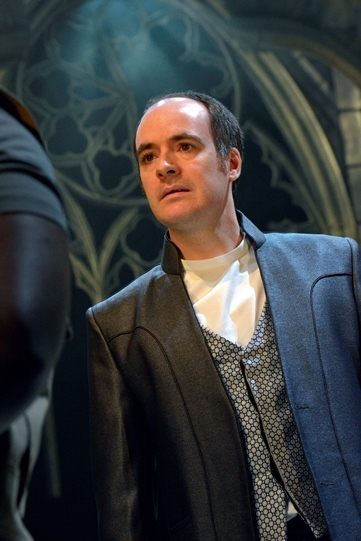 Comparisons with the last big production, with Rory Kinnear as Iago at the National Theatre in 2013 are inevitable. Both use desert-coloured modern uniforms, and emphasise soldierly comradeship in long drunken scenes at a modern military base. While the National went for realistic … Portakabins and a portable toilet block for that overhearing scene, this is a hyper-real world. The costumes emphasize that. Everyone’s battledress is slightly different and the details are like no known army. The shades of khaki, beige and white are not uniform either. So while it all reads “contemporary battledress uniform” it’s in its own world. The civilians emphasize this. The Duke of Venice (played by a woman, Nadia Albina, who was Nerissa in The Merchant of Venice) is in wonderful silver robes. Desdemona is in long dresses. Emilia in bright orange then in yellow. Tim Samuels as Lodovico, the Venetian Emissary who is the man in charge at the end, is in a silvery collarless suit … I was trying to get the references. I’d say futuristic, almost Star Wars civilian dress for those Venetians. Then Othello gets some exotically African waistcoats. It doesn’t entirely follow … Roderigo is gap year scruffy, while Desdemona’s father (Brian Protheroe) is red velvet cord jacket. The thing is, they all look good. They all create a world which does not reference a particular place or time. I prefer to say “Desdemona’s Father” because “Brabantio” is very close to the brand-name for swing top kitchen wastebins … Brabantia. The four lead parts, the ones which are not played in repertory but are just in this play, are all played by notable actors. Iago is the largest part … he gets more lines than Othello in the text. Lucian Msamati is short, sturdy, tough looking, shaven head. He is of Tanzanian origin. He was also the pirate captain in A Game of Thrones. Hugh Quarshie as Othello, has had a distinguished career, best known for his role in Holby City (of which I am totally ignorant). He looks distinguished. Handsome, short grey hair. There’s a dignified touch of Obama about him early on. Joanna Vanderham is Desdemona. 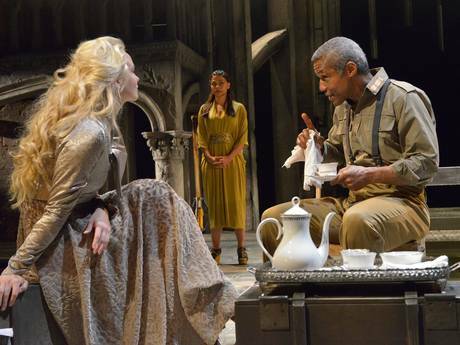 She’s extremely blonde, and it’s mildly amusing that in a production which tries to shake up the normal race balance of Othello, they still goes for a very white, very blonde Desdemona. Now if Desdemona was black as well that would shake it up. (OK, you’d have a problem with Brabantio’s lines). Joanna Vanderham is also an actress I greatly admire. She starred as Cathy in the brilliant 60s Soho gangster mini-series, The Runaway (2011) and was the nanny, Margo, in the film What Maisie Knew. Ayesha Dharker is an Indian actress of note. She is also extremely beautiful. I remember in the James McAvoy Macbeth saying ‘murdered’ sounded far more chilling in a rolling Scottish accent. A light Indian accent does the same with the word! 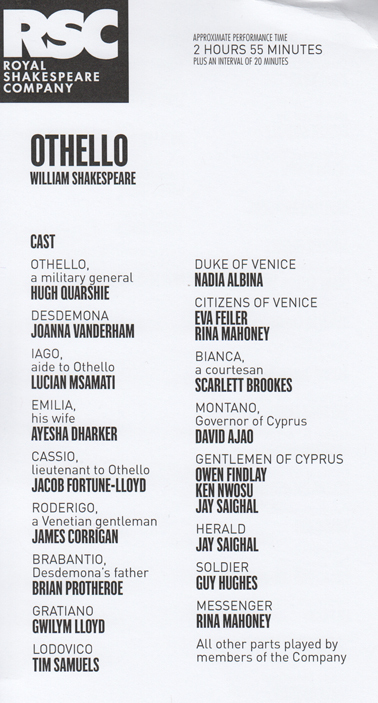 The four are all first-rate, and Cassio, the other central part, has Jacob Fortune-Lloyd, who was Bassanio in the alternating play, so he has two major roles. It was full of memorable interpretations of scenes. It starts with Iago and Roderigo boarding a gondola. The grid over the water slips away and it’s floating for the scene, which soon has Iago half-throttling Roderigo with the punting pole. Having a black Iago makes for an new look at the line when Roderigo refers to Othello as “thick lips” and we see Iago’s reactions, which he turns into a joking pulling at his own lips making blubbering noises. Then Iago punts the gondola away … the water extends into the wings. As in the National Theatre, the scene where Iago gets Cassio drunk is a major set piece with music. Squaddies getting totally wasted and breaking into a fight. 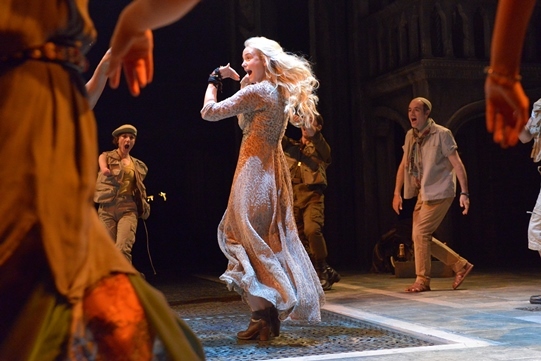 In this one, everyone’s dancing … Desdemona is in the centre. Iago sings a mournful East African song … unaccompanied and so good I’ll get the soundtrack CD next time I’m in Stratford. As he finishes Cassio takes the mic and sings the first line of Wimoweh aka The Lion Sleeps Tonight – “In the jungle, the mighty jungle, the lion sleeps tonight” thus unknowingly lampooning Iago’s song. Then it gets into an improvisd rap contest with various soldiers and Cassio making up ditties … one of Cassio’s is about Iago and ends (in rough memory) with ‘cos he’s black.’ So the scene is all set for a huge stage brawl with broken bottles over heads (sugar glass) and an almighty punch up before Othello is woken and strides in to stop it and ask who started it. Iago cunningly dropping Cassio in it while appearing to decline to say. It’s the centrepiece scene, with other black actors in it, doing the contrasting rap bits, I wasn’t sure whether the fight was black v white or not. In fact apart from that song and rap session and the “thick lips” bit, you never otherwise think, ‘Oh! Iago’s black!’ at all. Reviews said it fits because that’s why Othello trusts him and believes him. They’re both black. I’d totally disagree. I felt it was colour blind on that. The National Theatre one emphasized that they’d fought together so had a special close relationship with a bond of trust. I didn’t get that here either. What takes it away is that when Iago makes his accusation about Desdemona’s infidelity, Othello straps him to a chair, tortures him with a claw hammer than puts a plastic bag on his head and nearly asphyxiates him. I never got the impression that this Othello trusted or liked this Iago! 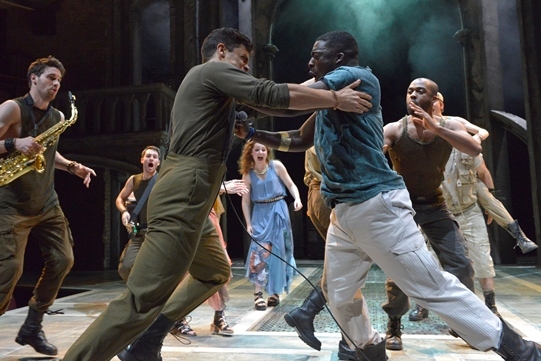 We also are not going to be surprised by Othello turning violent at the end. Iago throughout has an OCD cleaning obsession. After the fight he’s continually mopping up little bits from the stage with a hankie. We see the same with his hands and gloves later. 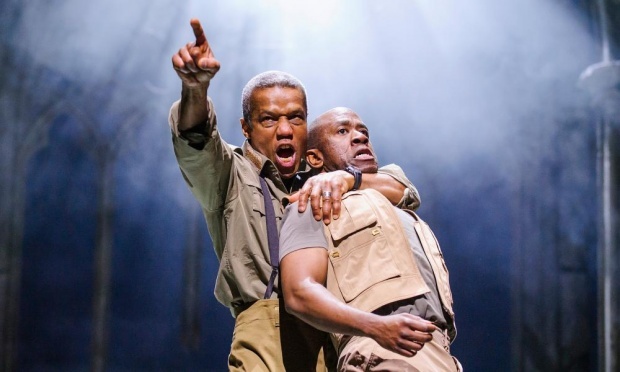 Hugh Quarshie has been much quoted for an article he wrote in 1998 where he said “Of all the parts in the canon, Othello is the one which should most definitely not be played by a black actor.” Now that he is playing it, he adds that black actors need to be aware and address the context from which the play springs. I’m not sure that having the plotter and villain as black too changes things that much. The ending is always the hard part to carry off. We have seen Othello standing aside while torture takes place, we’ve seen him brutally torture Iago. So there’s no surprise in him turning to violence at the end. That takes away from the tragedy of the good man forced into an unexpected piece of horror. But this Desdemona was so enticing and sweet at the end, that we do see Othello’s conflicting emotions. Emilia’s reactions, as she realizes what Iago has done, and her role in it, are also dramatic and convincing. Having a Desdemona and Emilia this good made that last scene work. It ends with Iago, kneeling, bloodied, tied, laughing out loud at the mayhem he’s caused. 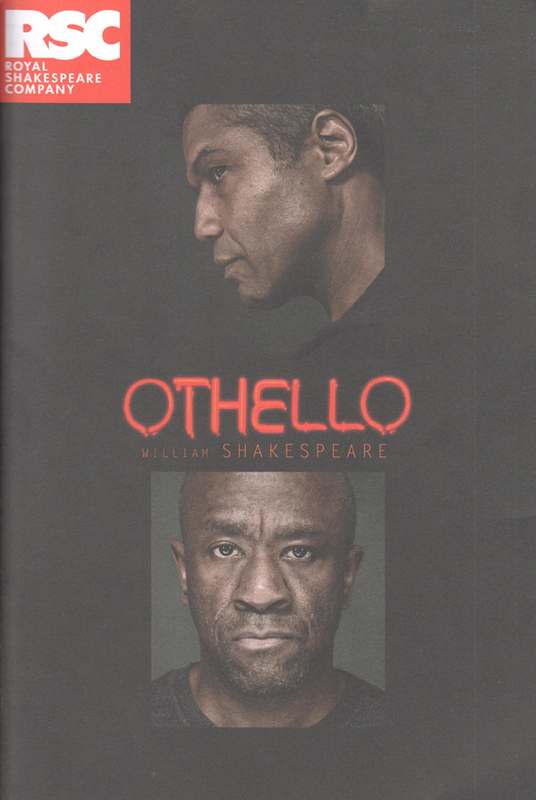 I had always found Othello the least favourite of the major tragedies, ever since the awful Olivier film (which was on sale in the RSC shop!). I just never liked the play and especially loathed the “jealous black man turns violent and murders white girl” ending. You’d think it would have gone down well among the Ku Klux Klan. The National Theatre one in 2013 upgraded my opinion because Iago manipulated so believably to create the situation, now a second truly great, exciting and first rate staging has upgraded it more. My memory of Laurence Olivier covered with black-green grease declaiming “DESDEMONA!” in a weird African accent is almost eradicated. This was the sort of compelling production which the RSC do sublimely. Sets, lighting, costumes, performance, direction are all at the level that keep us wanting to do that 150 mile journey several times a year.